In a career that spanned more than five decades, Al Williamson (1931-2010) earned a reputation for being a genre-defining science fiction artist, constant encourager of up and coming comics artists, and an all around wonderful human being who enriched the lives of others through his loyalty and friendship. Since his recent passing after a long battle with Alzheimer’s disease, there have been many warm tributes written of the man and his outstanding work. To get a better understanding of how one person can affect so many and achieve so much in a single lifetime, we need to go back to the beginning and find a young Williamson who from his earliest days was already dreaming of exotic far-away vistas and fantastical creatures unseen by the eyes of man. The boy’s love of adventure comic strips was boosted by the fact that his mother enjoyed reading them as well. In 1940 she took him to see the serial Flash Gordon Conquers the Universe, re-edited into two feature length films for the foreign audience. Not surprisingly the effect this had on young Al was huge. Of this he said, “I went back to see it again and again – it was to me what Star Wars was to a later generation.” This, coupled with his growing fascination for the beautifully illustrated Alex Raymond Flash Gordon newspaper strip, started his love of the character and his adventures that would last for the rest of his life. As a young teenager, Williamson and his mother moved to San Francisco, and later, New York. Upon returning to the States he became exposed to many American comics he was previously unaware of like Blackhawk, Superman, and Jungle Stories. By the late 40’s, he was taking classes at Burne Hogarth’s Cartoonists and Illustrators School. Hogarth was drawing the Tarzan newspaper strip at that time and Williamson quickly took to honing the brush and pen & ink techniques needed so that he too could brilliantly execute such work. It was at this time that he learned of the great illustrators of the past such as Franklin Both and Norman Lindsay, and also met some of his future E.C. comics collaborators like Wally Wood. By 1949, Williamson was steadily getting assignments from various publishers within the comics industry, with his pencils often being inked by his close friends Wood, Roy Krenkel, and Frank Frazetta. These friendships led to the formation of “The Fleagle Gang,” the close knit group of comics creating pals comprised of Williamson, Wood, Krenkel, and Frazetta, and also Angelo Torres, George Woodbridge, and Nick Meglin. In 1952 Williamson joined his friends at E.C. Comics and it was here that he would produce work that would not only be amongst his own greatest achievements, but also considered by many to be some of the best comics in the history of the medium. Tales like 50 Girls 50, By George, Captivity, and I, Spaceship are undisputed classics of science fiction and adventure comics and very rarely rivaled in the 55+ years since their initial publication. Also problematic for the Code was the end of the story where our explorers are consumed by a man-eating tree. An eighth page had to be added in which the men best the alien tree, which meant taking a page away from space reserved for much needed advertising revenue. This was one of many painful hits signaling the end of E.C.’s ground-breaking horror, crime, and sci-fi comics. With the Comics Code firmly in place, the industry, marred by lagging sales, went into a type of Dark Ages that would not show signs of lifting until the mid-60’s superhero renaissance brought about by Marvel. During this artistically stifled time, Williamson still was able to find steady work for companies like Dell, Harvey, and ACG. At this point he would produce many Westerns that were perfectly suited to showcase his talent for accurately depicting the human figure and naturalistic surroundings. 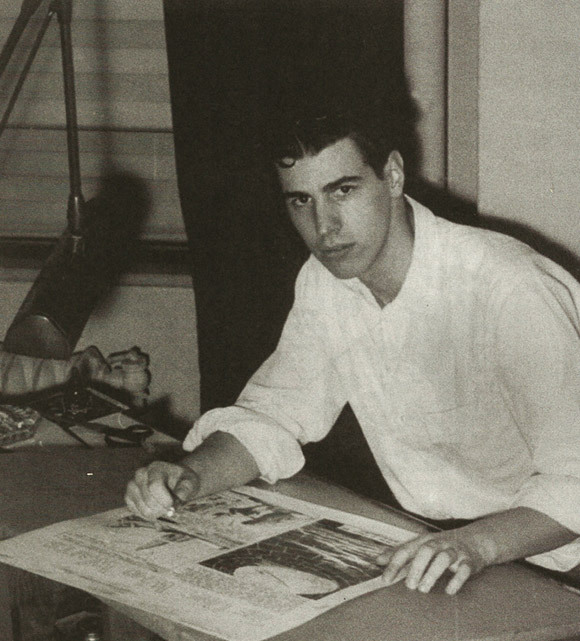 It was while at Harvey that Williamson would help Archie Goodwin get his first job writing for comics. The two would go to collaborate many times in the coming years as Goodwin became a leading comics writer for decades to come, at one point even finding himself as Marvel’s editor-in-chief. 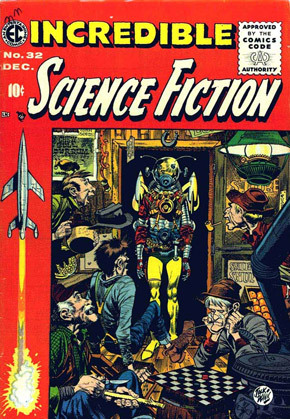 At this period of his career, Williamson still continued to received jobs for many science fiction comics and even the occasional war story. One extremely notable entry here is Helpless from 1957. Williamson often modeled for his own figure studies, and the face on the main character here is unmistakably his. The layout of this particular story is also very similar to the way he would present his Star Wars movie adaptations over 20 years later. 1964 was an extremely significant year in comics as it saw the publication of the first issue of Creepy, signaling the return to form of the horror comic. Many of the E.C. greats found steady work at Creepy (and its sister publication Eerie which began two years later.) Part of the significance of Creepy and Eerie is that its magazine format freed it from the restrictions of the Comics Code. Williamson would produce several memorable stories for these comic magazines, showing that he was as easily adept at drawing fiends from the grave as he was creatures from the stars. 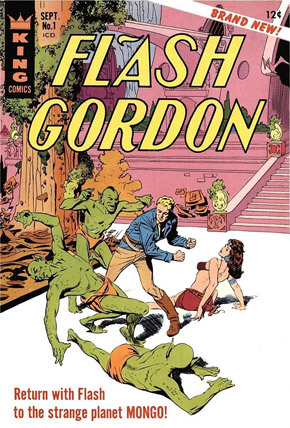 A watershed in Williamson’s career came in 1966 with the publication of Flash Gordon #1 from King Features. Now he had the chance to follow in the steps of his artistic hero Alex Raymond, yet still infuse Flash and his universe with his own unique style and flair. It is very evident how rewarding this work must have been for him and he would win a National Cartoonists Society Award for his efforts on this issue. Reader response was strong enough to bring Williamson back again for issues #4 & 5 of the series. During this period Williamson also took over the reigns of yet another Raymond creation, the strip Secret Agent X-9. The title was changed to Secret Agent Corrigan with Al’s friend Archie Goodwin handling the scripts. Looking at Corrigan from today’s perspective it is incredible to think that there was a time when sequential art of this high caliber appeared in the newspaper on a daily basis. Williamson would continue to illustrate the strip until leaving it in 1980 after a 13 year run. The late 60’s and 70’s saw the rise of a new generation of comics artists, and there are many stories of the extent Williamson would go to encourage, instruct, and find work for these young hopefuls who saw him not only as a mentor without equal, but also a friend. Bernie Wrightson, Bo Hampton, Michael Kaluta, Gerry Conway, Mark Schultz, and Thomas Yeates are only a small handful of the great talents he had helped realize their dreams in early stages of their careers. A particularly touching tribute in the wake of Williamson’s passing is by the brilliant William Stout and can be read here. One can image an artist being strongly influenced by Williamson’s work only to collaborate years later with the man himself! 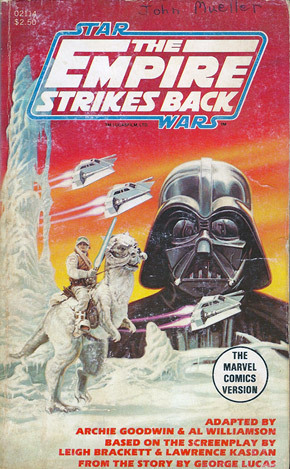 In the early 1980’s Williamson would again team with writer Goodwin for the Marvel comics adaptations of the films The Empire Strikes Back, Blade Runner, and Return of the Jedi. The art of these books perfectly capture the tone and excitement of the movies on which they are based, a true rarity for such a publication. Lucasfilm itself sought out Williamson to adapt Empire, and this is not a surprise considering that George Lucas was strongly influenced in his youth by the 1950’s E.C. science fiction comics.This would spark the continued close association between the worlds of Star Wars and the name of Al Williamson. For an entire generation of 80’s kids this would be their introduction to his spectacular art and I myself have been a fan ever since. Goodwin and Williamson would also take over the reigns of the fantastic Star Wars daily strip from Alfredo Alcala. For a much more in-depth look at Williamson’s movie adaptations, please see a prior installment of Sequential Sunday which you can find here. Williamson would contribute wonderful (yet sporadic) work to the indie boom of the 1980’s, most notably at Pacific Comics on titles like Alien Worlds and Vanguard Illustrated. With over thirty years of astounding art already under his belt, Williamson began a new phase of his career in the mid-80’s as an inker. This period began first at DC, then at Marvel working with such outstanding pencillers as John Buscema, John Romita Jr., Mike Mignola, and Gene Colan. Not surprisingly, his work from this time garnered him 2 Eisner Awards and 7 Harvey Awards for Best Inker. The early 90’s also saw him return to the Star Wars universe he was so wonderful at depicting, supplying cover art when Dark Horse began reprinting his Star Wars daily strips in a 20 issue series. His final work in comics was providing inks for the Marvel titles Spider-Man 2099, Daredevil, and Spider-Girl up to 2003. In his seventies at this time, and with a lifetime of high artistic achievement behind him, he retired in Pennsylvania with his wife Corina. Al Williamson passed away on June 12, 2010. Perhaps Al Williamson’s greatest achievement was ensuring the continuance of the great American Illustrative tradition. There is a very discernible through-line one can trace of the great representational (yet still fantastical) American artists of the last 100+ years. From Charles R. Knight and Franklin Booth to Alex Raymond and Al Williamson to William Stout and Mark Schultz, a grand tradition of technical brilliance and tremendous imagination is being upheld. One generation inspires the next and Williamson has (and will continue to) inspire many. And it is through his work that Al Williamson will truly live forever.